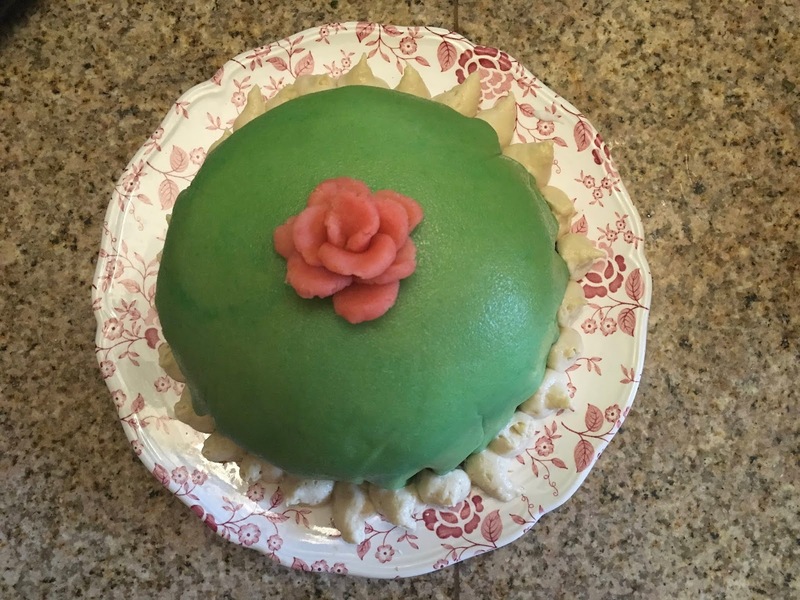 myrrhmalade: Yes, Daddy can have a Princess Cake this year too. I'm so glad that I checked my notes from Daddy's Princess Cake last year, because I almost made it the same way. This year, I made an einkorn sponge cake using the recipe from Carla Bartolucci's: Einkorn: Recipes for Nature's Original Wheat. The sponge cake has no added fat (other than in the egg yolks) which is quite well suited to the einkorn flour. I was surprised at how easy the recipe was and how well it came out, even with all the "help." I want to experiment with using maple sugar for sweetener as well as cutting down the overall level of sweetness without sacrificing the structure. This year I made a crème pâtissière (creme pat) using canned coconut milk instead of almond milk. It was much creamier and way more delicious. I'll definitely do it again with coconut next year. Last year we used seeded raspberry jam. This year I used a blackberry conserve (strained, so it's no longer "jam") without seeds. A much softer flavor with less acidity but just as delicious. 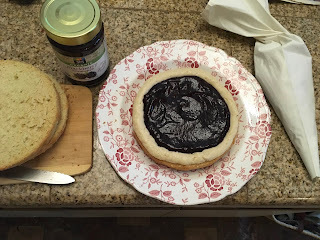 The first filling layer has piped creme pat around the edge, the center filled with jam. The second layer is just piped creme pat (forgot to take a photo). On top of the third cake layer is a dome of creme that you can kind of see in the photo below. Just like last year I used coconut milk -chilled so the watery liquid is drained off. Next year I think I may add a bit of gelatin to help the cream hold its shape. It began to squidge out a bit after cutting the cake. Cover the whole shebang with marzipan colored grass-hill-green and top with a marzipan rose. Next year, I think I'll try a 1/2 recipe of the einkorn sponge cake, seedless conserve, and be a big brave bunny and make my own marzipan, like I threatened last year. The boughten marzipan is just SO sweet with that it drowns some of the other, more subtle textures and flavors. Naturally sweet marzipan looks super simple - find ground blanched almond flour, maple syrup/honey, vanilla/rosewater/amaretto. Happy birthday my dear HandsomeJoe. We will make you a Princess Cake any year you like.